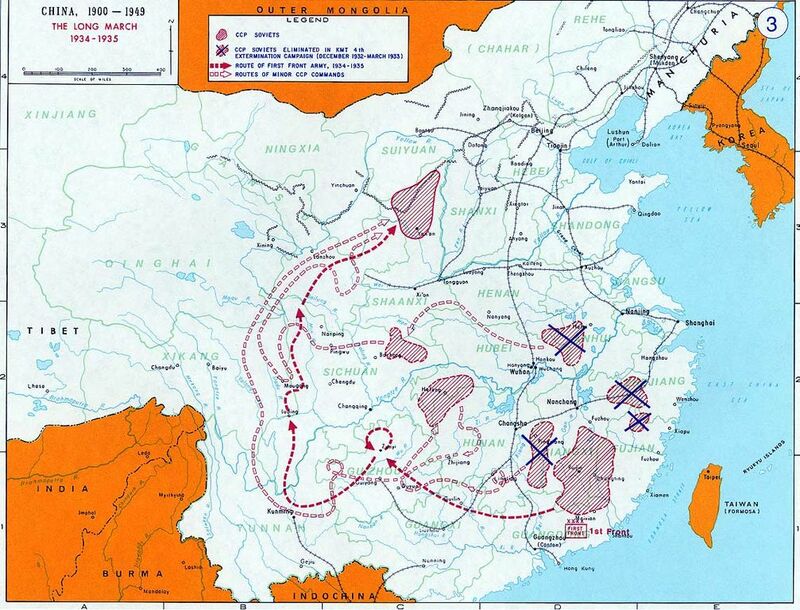 Despite defeating four consecutive Encirclement Campaigns on the Jiangxi Soviet by the KMT between 1930-33, the CCP’s Red Army eventually met its downfall in the October 1933 Fifth Encirclement campaign, which enlisted over 1 million Nationalist troops and 200 aircraft. Chiang developed the so-called “Iron Bucket Plan” for the campaign to turn Mao’s guerrilla warfare on its head – 30 blockade lines were built in the region 150 km around Rujin, supported by 30 barbed wire fences, to starve the Communists. The plan was to gradually tighten the siege ring around the CCP through the building of blockhouses that would form the blockade lines, with 14,000 of these blockhouses built by 1934. This left the Red Army with little territory in which to carry out its previously successful guerrilla tactics, forcing them to confront Nationalist troops in conventional trench warfare. 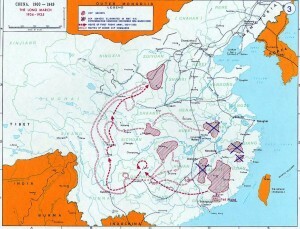 The CCP suffered its first major defeat in the Battle of Guangchang on 11-16 April 1934, which left 4,000 Communist troops dead and 20,000 wounded. By September 1934 60 out of 70 Communist-held countries had been conquered and Ruijin had to be abandoned, with 80,000 soldiers and 20,000 support staff setting out from Ruijin on 16 October 1934. The CCP meanwhile portrayed the retreat as a patriotic crusade to march north to resist the Japanese incursion (referring to the Mukden Incident). An Anti-Japanese vanguard column of 6000 men was sent out in a more northerly direction than the bulk of the Red Army, being used to deflect Chiang’s troops and give the Red Army a chance to escape from Jiangxi1. The first major battle of the march occurred between 25 November and 3 December 1934 at the Xiang River. The Red Army escaped, but lost 50,000 troops – historian Sun Suyun argues that “at most 15,000 died, while the majority almost certainly deserted”2.. Mao believed that these losses had been sustained due to the marchers being hampered by too much equipment and a predictable route, calling for a return to guerrilla tactics. confuse the Nationalists and eventually meet up with another section of the Red Army, the Fourth Front Army led by Zhang Guotao. 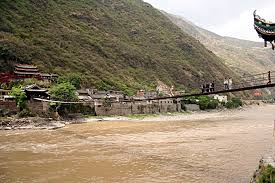 To reach the meeting point, the troops were forced to cross Luding Bridge – when they arrived at the bridge on May 29, it had been torn up by the local warlord’s troops, leaving only chains swaying. Despite this, the troops proceeded to cross the bridge, under what CCP history alleges was heavy fire, managing to get to the other side and defeat their opponents with the loss of only four men. This feat was later lionised in CCP propaganda, being portrayed as the ultimate expression of the fearless Red Army spirit. However, there is evidence to suggest that the warlord troops the Red Army was facing had deliberately put up only a half-hearted resistance, due to CCP figures Zhu De and Li Bocheng bribing the local warlord, Liu Wenhui, to allow them safe passage through his territory. Lacking funds and reliable equipment production methods, the marchers were often forced to fight using miniscule amounts of weapons. Each soldier was granted 5 bullets and 3 grenades for an assault, and some platoons only had one rifle between them. The Nationalists, meanwhile, spent nearly 60 million silver dollars in 1933-34 importing state-of-the-art rifles, artillery and planes from American and Europe, with their army being supported by 200 planes. Most of these, however, ended up in the hands of the Communists. The sheer number of marchers and equipment meant that the marching columns could be as much as 80 km long, making them vulnerable to attack and easy to spot. They were also slow, with the Central Column, which included Party officials and their spouses, covering barely 6 miles a day. Many of the marchers had been hastily conscripted into the Red Army to break the Fifth Encirclement campaign, and thus were not given proper training before embarking on military campaigns. Liu Bocheng, the Chief of Staff of the Red Army and Commandant of its academy admitted that “many of our soldiers do not know how to shoot accurately or use a bayonet”. As a result of this lack of preparation and the sheer difficulty of life on the March, many soldiers deserted, with some divisions losing one third of their men to desertion. In August 1935, the marchers entered the Tibetan grasslands. The area that they passed through had a population of 220,000 with just enough grain and cattle to feed themselves and leave a small reserve – the appearance of the Red Army meant an extra 100,000 mouths to feed. The local populations thus became hostile towards the marchers, sniping at soldiers when they tried to cut barley for food. 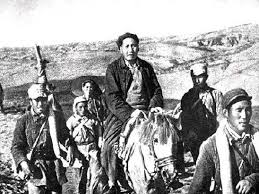 Although the Red Army left money or IOUs in the fields they harvested or for the animals they took away, this did not mean much to the Tibetans who were too isolated from other provinces to be able to go there to buy food. Sun Shuyun argues that “there is no doubt that the Tibetans suffered at the hands of the Red Army”. Prior to the beginning of the march, Mao had been sidelined in leadership, being replaced by Zhou Enlai as general political commissar of the Red Army on 12 October 1932 – this was partially due to Mao’s belief in a peasant-based revolution contrasting with the urban-based approach of the CCP Politburo. As a result, Mao did not take part in the decision made in May 1934 to leave the Jianxi Soviet and only learnt of it in August. The turning point for Mao’s leadership came in January 1935. On 15-17 January a CCP conference was held in the recently captured town of Zunyi, aiming to discuss and address the failures that had led to having to leave Jiangxi and the huge loss of men at Xiang River. The Soviet-sent adviser Otto Braun and Bo Gu were largely blamed, as they had been given full command of the Red Army in the last half of 1933. Mao argued that it had been a mistake to abandon the guerrilla tactics which had been successful in the past, sidelining Braun and Bo Gu. At the end of the conference, Mao emerged as Party Secretary, marking a shift in the influence he held. From the Zunyi Conference onwards, troops were given explanations of their movements and guerrilla warfare was again espoused, with Mao’s army taking an extremely confused route following the conference, which involved crossing the Chi River four times. In November 1935, shortly after settling in northern Shaanxi, Mao officially took over Zhou Enlai’s leading position in the Red Army. There, Mao became the chairman of the Military Commission, with Zhou and Deng Xiaoping as vice-chairmen. north-west, and the Long March was declared over. After occupying over 60 towns and cities, travelling 12,000 km through 11 provinces in one year, crossing 24 rivers and 18 mountain ranges, the marchers had reached a province where they could found a Soviet. Only 7% of the marchers who had set out from Jiangxi had made it to Shaanxi, but the fact that they had done so and the CCP had been preserved was due to a variety of factors. The warlords who controlled the provinces surrounding Jiangxi were often willing to speed the Red Army on its way to deny Chiang the ability to take over their lands at the same time as fighting the Red Army. On 6 October 1934 Chen Jitang, the warlord of Guangdong, signed a secret treaty with the CCP that arranged for a ceasefire, exchange of intelligence, free trade and right of way for the Red Army. In the north, meanwhile, the CCP found a willing ally in the warlord Zhang Zueliang, the so-called Young Marshal, who officially was allied with Chiang. Zhang, as the warlord of provinces that bordered the now Japanese-controlled Manchuria, wanted Chiang to stop fighting the Communists and help repel the Japanese invasion – however, Chiang insisted on finishing off the Communists before taking on the Japanese, saying that the Communists were a “disease of the heart” while Japan was only a “disease of the skin”. The only people strong enough to help Zhang repel the Japanese were the Russians, and thus Zhang approached the Communists for help. Attempting to woo them into convincing the Soviet Union to give him military backing, Zhang practically kept the Red Army alive with supplies he received from Chiang. In 1936 alone he gave over 700,000 fabi (the Nationalist currency) to the Communists, while their total yearly expenses were 560,000 fabi, also providing them with 10,000 winter outfits. The Long March provided the CCP with an opportunity to take its message of socialist revolution directly to the people of China. Mao had laid down the rules for propaganda in the Red Army in December 1929, telling the soldiers that they were not just an army, but an army with a political purpose. A printing press was brought on the march, and it printed 40,000 copies of the CCP Red Star newspaper over the course of the march. Propaganda teams existed in every military unit, and often set propaganda songs to folk tunes to make them easier for villagers to remember. Poster-writing teams had a minimum quota of 50 posters a day, sometimes as many as 200. The CCP was presented as a nationalist organisation, marching north to fight the Japanese and fighting for the welfare of common Chinese people, leading to locals lending them more support than they did to Nationalist armies.